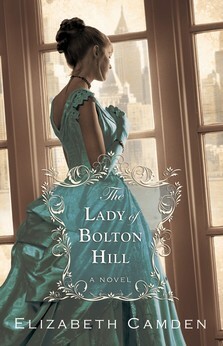 I'm so pleased to welcome Elizabeth Camden today to share about her book The Lady of Bolton Hill and romance in general! Thank you for making space on your blog for me! I have been addicted to novels, especially to romance novels, ever since the tender age of about twelve, so it is a real thrill to cross the threshold and start producing them. For me, the romantic aspect of a novel is a huge draw. I want it to be front and center. Now, when I say “romance,” I am not talking about poetry and roses and chocolate. I am more interested in the Beethoven-type of romance. I like the dark & stormy, the soaring joy and crashing back down to the earth, then rising again into the clear light of daybreak. This is risky in a novel. The reader needs to have confidence in the inherent goodness and wisdom of the lead characters in order to want to go along for the ride. I hope I was able to capture those aspects in The Lady of Bolton Hill. My hero, Daniel Tremain, was great fun to write about. He storms, he weeps, he rages—but when he loves it is with both hands stretched out and his heart on the line. That is what I mean by romance. Someone who will smash through any barrier to get to the woman he needs. Cross a storm-tossed sea. Slay the dragon. You get the idea. Now, the romance genre tends to get a lot of guff from people who have never dipped their toe into the wonderful, turbulent, fabulous pages of a romance novel. The unfortunate covers of some mainstream romance novels have given a black-eye to the entire genre, which is a shame, because I have found most romance novels tend to be highly moralistic and life-affirming. No Heroine Should Expect to be Rescued. Any heroine who waits for a rescue will never get the respect of the reader. If a damsel in distress isn’t doing something meaningful to fix her situation, she is not a very appealing character. This is as true in novels, and true in real life. If you Don’t Treat Your Man Well, Someone Else Will. Remember Scarlett O’Hara? Time and again she snubs Rhett, driving him straight into the attentive arms of Belle Watling. There is a certain amount of routine maintenance that goes into a great relationship. Men don’t like being taken for granted any more than women do. Your past will come back to haunt you. Sometimes the heroine takes the easy way out. She may deceive the hero, take a short cut, or tell a white lie. These failings are always discovered, and usually results in a double helping of humiliation. It is far better to write your life story accurately and with honor the first time around. Falling in Love involves Risk. For a relationship to take root and flourish, both sides need to open up, share their deepest vulnerabilities, fears, and aspirations. This is scary. When you lay your heart on the line, there is always the danger that it is going to get stomped on. The characters in a romance novel will learn how to overcome embarrassment, the risk of rejection, and become vulnerable enough to fall in love. That is huge. Some people go through their entire lives and never learn how to do it, but not so in a romance novel. It’s Never too Late to Redefine Your Life. Most heroines begin the book in a tough place, but they never end that way. Change is scary, hard, and messy. Most things worth fighting for are! If you are dissatisfied with your life, figure out an area you can redefine, make a plan, then kick it into gear. Your story will end in a better place if you do. Thanks for letting me drop by to talk about my favorite subject. I adore a great, fabulous romance novel and never tire of rambling on about the topic. I regularly blog about my thoughts on romance as a genre (in films, books, art, life, etc.) at http://elizabethcamden.com/blog I hope you’ll pop over some time!